Shorshe Ilish is a traditional dish from Bengal which is made with Ilish or Hilsa fish. Nothing could be more delicious and blissful for Bong of having this Sorshe Ilish pieces with hot steamed rice. This is a classic Bengali fish curry cooked in delectable mustard gravy. 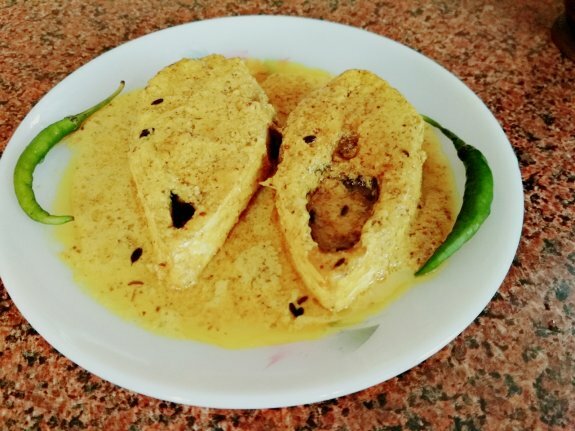 There are several other fish recipes in Bengal including Bhetki Macher Rasa, Chingrir Malaikari, Mourala Macher Jhol, Lau Chingri, Shorshe Parshe, Tangra Charchari, Katla Macher Rasa etc. but this is one of the most treated dishes among several other fish dishes mainly when you have any special occasion or appearing of guests in your house. 1. Marinate the Ilish pieces very carefully with 1 tsp turmeric powder and salt and keep it aside for 5-6 minutes. 2. Take a medium size bowl and add mustard seeds paste, poppy seeds paste, green chilies paste, 1 tsp turmeric powder and salt. Mix everything very well with spoon. 3. Now, heat 5 Tbsp of mustard oil in a pan. Keep aside rest of 2 Tbsp of mustard oil that we will use later. When oil becomes hot, add cumin seed, bay leaf and dry red chili. 4. When cumin seeds splutter, add the mix paste into it. Stir for 2-3 minutes. Lower the flame of the gas oven. If you think more salt or turmeric powder is required you can add in this time. 5. After 3 minutes add 1 cup of warm water and mix. 6. After 2-3 minutes when curry starts boiling add the marinated Ilish pieces gently into it. Stir it lightly. Cover and cook it for 3-4 minutes. 7. After 4 minutes, remove the lid and flip the fish pieces very carefully so that the other side will also cook properly. Add the whole splited green chilies into it. Again cover it with lid and cook for another 3-4 minutes. Remember to notice the gravy as it should not be very thick or dry. If you think you need some more water, you can add 1-2 Tbsp of warm water again while flipping the other side. 8. Now, after another 4 minutes remove the cover. Stir it lightly and add the 2 Tbsp of mustard oil and carefully stir it with the gravy. You Sorshe Ilish is ready to eat. Serve your Sorshe Ilish or Ilish Sorshe with hot steamed rice.